In remote areas of the hilly tracks of Western Maharashtra (Mulshi, Mawal tal., Pune dist. ), for the last several years, rural women from lower social strata commit themselves to tasks of Primary Health Care education. They also organise local population on basic public health issues and attempt to motivate other women to take initiatives of collective interest to the benefit of their village community. We tried with them, in several self-study meetings, to define the steps which progressively led them to commit themselves to act, with health in hand, as social actor. That retrospective self-investigation started with memories tracing back to the very beginning of their involvement, a couple of years earlier, at a time when they had no idea whatsoever about health, social action and people's organisation. (The entire exercise is reported in Health in People's Hand, study supported by ICSSR and published by FRCH, Bombay, 1988). Four main lessons of methodology were drawn from this case-study carried out cooperatively by all those concerned and involved in the scheme. First, the method of joint self-evaluation promoted a more critical consciousness and, consequently, fostered the process of autonomous self-determination. It developed also the theoretical ability of the members of the action-group to clarify their objectives, methodological perspectives and identity as social actors. Second, in-depth micro-studies are unavoidably to be resorted to when one is looking for emerging alternatives at the local level and among powerless social sections. The validity of such in-depth studies is nonetheless not to be undermined with regard to the needs of those concerned with macro-analyses and large scale policies. The latter would remain futile exercise if one would not take into account the dynamics operating at the grassroot level. Third, the role of the research-worker intervening from outside the group consists in raising specific analytical questions meant to engineer a process of collective self-analysis in small groups or with individuals, and widen the theoretical horizon with adequate concepts. This rapport ought not to be a one-way flow of queries as in the procedures of a police investigation to which field research in anthropology is often comparable. The research-worker's concepts and tools are equally liable to scrutiny on the part of those involved in the process of investigation. Fourth, the process is slow and may sometimes take still more time with participants who have never been subject to any practice of formal schooling. As a rule, it is not easy, on the part of actors who have not been trained to self-introspection and are not used to take distance from their own activities and motivations, to generalise and objectify their practice. Still, free exchanges in study-groups are the best and fastest way towards learning that hard mental discipline and transcend the narrow limits of one's immediate and blindly subjective let alone emotive consciousness. Cooperative discipline is the best asset to develop habits of conceptualisation and train to methods of social analysis. The following seven progressive stages project a sort of FIGURE or MICRO-SYSTEM of a PARTICULAR STYLE of communication, one conducive to personal commitment to collective social action and socio-cultural animation. Before we articulate these seven analytical steps, attention should be drawn upon two essential structural dimensions of those processes through which a rural woman from lower social strata is progressively led to assert herself as social animator with health in hand. The first one is the attractive example of another rural woman similar to her and actually engaged in health animation work. The second one is the time factor. Time is an essential factor as besides technical knowledge to be received and circulated, each woman animator has to think anew about her social identity and her relations with other people in the village. She has to be ready to face external and internal constraints and objections. The established systems of social communication which prevail in the village have an authority upon the minds that women animators can not internally withstand all of a sudden. This slow internal transformation of attitudes and convictions takes place thanks to the company and support of those elders who show the way and whom one comes to follow almost spontaneously through imitation, although slowly. This process is not of the nature of circulation of knowledge but of transformation of conducts leading to find from within, in oneself, the mental strength required to innovate. 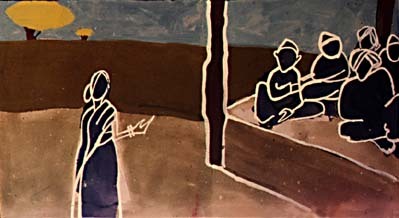 If a social actor/animator who cannot be externally appointed as a social worker happens to become an employee of a NGO for limited and specific welfare tasks, the psychological moves which result in positively volunteering to act as such represents a slow process which may usually take between six months and two years or more and depends upon the mediating role of a former female whose example is appealing and supportive. The scenario usually comprises the following stages. 1. Visit and meet. Initially, a general information is circulated by a first woman, herself involved in the health programme, about what is going on, and as she perceives her work on the basis of her own experience. The observation of the study-group is: "So and so came... They talked with us about the Organisation of the Poor of the Mountain... They gave us some medicines... We saw the advantages of their work as we could avoid going to hospital... They held a meeting in the village... They informed us..." The first stage of announcement is carried and circulated through personal encounters, in which a lady with experience shares with individuals and within small groups convened to that effect, what she has actually done and experimented. 2. Invitation. A call is explicitly made, during these meets, to women assembled, for then too to join the group of the first health women-animators: "Come and see, come and attend one of our group-meetings..." Second step: an overt call is to be made. 3. Appeal. Potential volunteers "feel prompted to go and see". A wish appears to join. "I thought: they are right". "I wanted also to get information on health". Third step: a desire grows to act and follow the example given. 4. 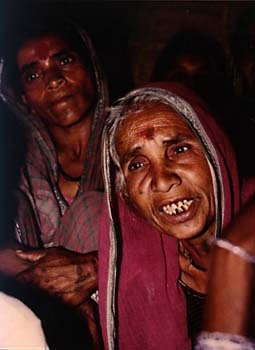 Occasional attendance of local women's meetings held on health by those women-animators in charge. The liking increases. More information is obtained about health work and children's care. 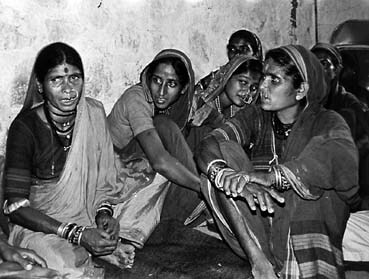 This attendance is sometimes facilitated by the fact that a few other women from the same village or hamlet are going to attend the same meeting. Otherwise, the potential volunteer will go alone and the decision requires more courage and capacity of initiative. This is the example of Sitabai: "They told me: 'Follow us! Come with us!' I did not dare. Still, I went to the meeting by another way. I was thinking: 'I can go alone!' This set my heart beating. I realised that their work was a genuine one. I was telling myself: 'This is not a bad thing!' To-day, I bring some one with me to attend the same meeting. As a matter of fact, Sitabai, four years ago, attended only two monthly meetings and then stopped attending them for two years, because people were calling her names. But she thought over it again and convinced herself of the advantages of the health services offered by the scheme. The initial contacts with and company of the members of the action-group strengthens the original wish to participate and get actually involved. Supplementary information is obtained about the advantages of the task, for oneself and for the village. The fourth step consists in one coming directly in touch with the concrete experience of those who have done something. 5. Time of slow acquaintance with those involved and their task, through prolonged contacts and familiar interaction with them. One does not immediately, all of a sudden, decide to commit oneself to play a new role and discharge new tasks of social action with the same facility as one would avail of an employment opportunity and join a new post or office. A first reason is that social pressure (constraints and inhibitions) makes one hesitate: one's caste is given low status and looked down upon; women from any caste are looked down upon by men ("Will people listen to me?" "Will people take me seriously?" "Am I really capable of the same achievement?"). Self-confidence and assertion are the fruit of a prolonged time of personal acquaintance with those engaged in the task. 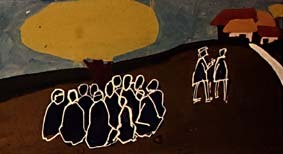 During this period of time, the potential woman-animator attends monthly health training-meetings and takes part in other collective activities of the Organisation, such as camps, demonstrations, etc. The liking for health activities increases with the satisfaction of being able to understand the teaching of the doctor. The existence and work of other groups works as a moral backing. The would-be volunteer imbibes the spirit which shapes the style of health intervention. When she realises her ability to understand and learn a medical knowledge, she sheds her fear and with the support of the group, she discovers how to face people's objections. This fifth step of initiation is the most lengthy and important at the beginning of any such scheme of social action, when concrete models of behaviour and intervention are not many. When the style of intervention spreads, its figure becomes visible and slowly stands for itself with an authority of its own. It enjoys a sort of recognition; its validity is less challenged and the weight of inhibiting social and internal pressures is less felt. 6. Explicit proposal to take up a health responsibility as a collective social commitment (and not as a medical service) in the manner taught in the group. An example: Ramabai was selected by her local action-group; people objected: "She is not educated, how can she attend the meetings and learn something? " An elder lady replied: "We give from our hands, we give from our brain; they give from their books" (Government selects only people with some schooling). "How many days shall you eat from our hands? Appoint this lady from among you and your village will improve. We come from far away. If you send your woman, she will tell you back something useful afterwards". This is the step of a collective assignation made in front of a group of people assembled. 7. A sense of commitment. Attitudes of resolute implication grow and the initial fear is definitely overcome. This is the final stage, when tasks and objectives are understood: "I conduct meetings. I repeat what I have learnt. I inform people and give them medicines. We must teach others. People like it". This is the stage of people's education and socio-cultural animation. These analyses stress the following processes which we like to conceive as a basic logic or grammar of social commitment. Personal acquaintance and a prolonged time of a 'wait and see' attitude precedes any decision. The example and concrete testimony of some one else are necessary as a preliminary step. A clear invitation or explicit call to join is required for one to elicit not a purely individual move but a commitment to participate in a collective effort. The initial moves and attempts are usually met with laughing, counter-propaganda, lack of appreciation on the part of the population of the village around. The decision to join is personal and motivated by a will to achieve something and dedicate oneself to a task whose relevance is understood, and once this relevance is understood. This understanding increases the strength of the personal motivation and develops progressively a wider and realistic social consciousness. The motivation takes momentum over a period of time, in front of objections, out of one's own effective commitment to tasks which are experienced as beneficial. Action generates self-assertion. The group proves to be the best backing of the personal attempts and efforts: these would not last without a team. The small group of likely-minded people is an essential structural requisite. General elements of personality growth and development -- ability to express oneself and talk in front of a group, capability to understand a knowledge previously considered as out of reach, assertive behaviour) etc. -- work as a gratification which encourages to go ahead. When money and honorarium crop up as the main determinants or the motivating factor -- as is the case with any sort of institutional employment -- no effective health animation can stand as a medium of social action. Monetary compensation is legitimate and may not go against interest in social action, but once this interest is maintained by monetary incentives only, we can not expect it to develop into a social concern for health and a commitment for community organisation. The appeal on potential volunteers is proportionate to the cultural, material, educational, social, etc. similarity or proximity obtaining between them and the previous voluntaries who invite to join and set an example. The interest in health is enhanced and sustained by the wider range of issues dealt with in other meetings of the whole Organisation (of the Poor of the Mountain).